Earlier this week, the Syrian army, supported by Russian military aviation and pro-government militia, successfully liberated the strategic southern Syrian border town of Sheikh Miskeen. The town's capture, a Russian reporter embedded on the ground suggests, is possibly the most important victory on the southern front to date. The town, located in Syria's Daraa province near the Jordanian border, previously served as a 'launch pad' for militant operations in the area, and as a vital crossroads between Damascus in the north and the Jordanian border to the south. Fierce battles for the town raged for nearly a month. Miraculously, government forces managed to capture it with minimal losses. A RIA Novosti correspondent became one of the first journalists to enter the city, only a day after its liberation, and managed to speak with the commanders of the army's assault detachments, getting the scoop on this, one of the most successful operations of the Syrian army on the southern front to date. "The town of Sheikh Miskin is just one hour's drive from Damascus," correspondent Mikhail Alaeddin writes. "In every direction, one can enjoy the view of the snow-capped peaks of the Golan Heights…If not for the war, one could imagine this place as an option for a nice, quiet family holiday." "But today's trip was not a tourist excursion. Sheikh Miskin is completely destroyed. Apart from the army, there is not a living soul here. Even animals seem to have abandoned this place." "Fierce battles for the city raged for 28 days. Twelve terrorist groups, including the famous al-Nusra Front and Daesh, forgot about their differences and united to try to keep control of the town at all costs." "It's easy to understand the militants' motivation," Alaeddin explains. "The city sits at the intersection of government roads connecting Damascus, Daraa and Qunaitra. It is also the shortest and most convenient way to get supplies on the southern front. These same roads were used by terrorists, who shipped reinforcements and ammunition into the area from Jordanian territory." "Back in early December, we visited the front line, which was then 70 meters from the town. Then, the terrorists were attempting to assault army positions in order to cut off what at the time was the only road linking Damascus with the south of the country. Today, the canvas is painted a different color." "Arriving at the central square," the journalist writes, "journalists happened upon the division commander – Brigadier General Samir Uasilya. He led the storm of the town, and now stood, explaining something to his officers on a map on the hood of a car. When he finished, he found a couple of minutes to speak to the media about the assault." "We caught the enemy by surprise. Yesterday we began our assault from the north side of the town. The enemy did not expect such a rapid advance from that direction. We were able to break through to the troops advancing from the east. From the air, we got a lot of help from precision strikes by Russian aircraft," the commander said, unable to hide his smile. 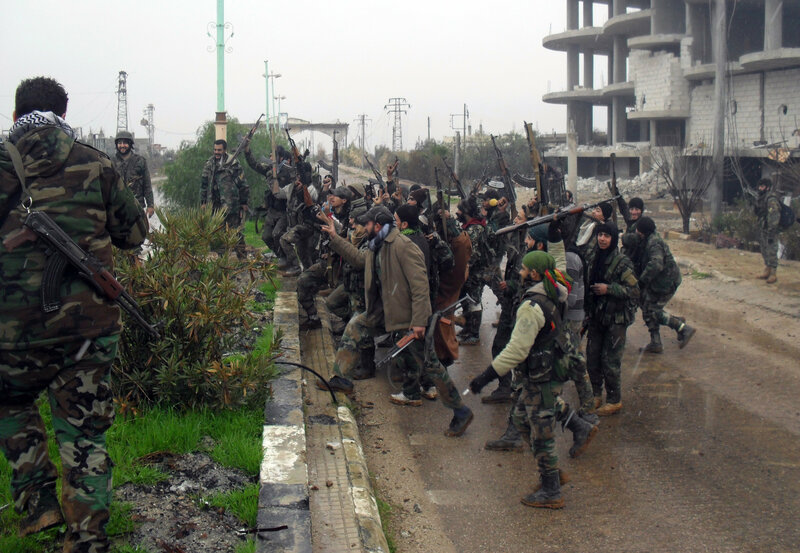 "At the beginning of the assault," Alaeddin noted, "there were an estimated 2,500 thousand fighters. Within a few hours over a hundred were eliminated. Syrian officers said that the gangs' leaders managed to escape to Jordan, while the less important militants retreated to neighboring towns. The army, for its part, faced minimal losses, thanks to careful preparation and elaborate planning ahead of the attack." "One of the main sights of the city today was the height, named after Mohammed Fares, the commander of the assault detachment which liberated it from the insurgents." "Fares is a hero – there is no doubt about it," detachment commander Aqeedah Hauazim told Alaeddin. "He and his boys, receiving the order to capture the height, immediately left for the area. The outcome of the assault on the city depended on him. From the height, the whole town is in the palm of your hand. The enemy might have detected the offensive from the north and hit back with heavy guns. Fares took a small group with him in the night and attacked the enemy position. The fight was terrifying, but the weather helped. The guys climbed to the height undetected during the heavy rain, but then came under attack from all sides, and my detachment was among those that came to the rescue." Fares was wounded, Hauazim noted, but stayed on the battlefield until reinforcements arrived. Before losing consciousness, he managed to give his last order: "Keep the height at all cost – it is the key to the city." "The soldiers," Alaeddin notes, "complied with the commander's orders." "Walking from the height to the depths of the city, it's hard not to look at the villas with marble columns and arches. Apparently, before the war, they looked beautiful and rich, and the land around them was not earth pitted by shells, but green gardens with orange and olive trees." "One can only walk through the city in the center of the road. Retreating, the militants mined almost all the houses here. On the side of the road one comes across unexploded shells and 'tricky' boxes. From different corners of the city, one can hear powerful explosions – this is the work of the engineers. The officer told us that some of the devices must be destroyed in place; otherwise, they might detonate at the slightest touch." "Listening to the stories about the war's exploits, journalists unexpectedly approach the former headquarters of one of the al-Nusra Front brigades in a school, where in the playground they saw a horrible scene: dozens of new graves and two deep trenches, apparently dug for the new dead. The only calming thought is the fact that the pits are filled with militants, and not soldiers or civilians; the number of graves confirms the army's word about the enemy's losses." "The liberation of Sheikh Miskin," Alaeddin concludes, "is a great success for the Syrian armed forces, significantly raising their morale. Officers are ready to move on, to break through with their men to the city of Daraa, to fight to liberate the entirety of the southern province, and the country as a whole. The impression here is that the soldiers, exhausted by five years of war, have gotten a second wind, and the finish line for this 'tragic marathon' is not far away now."